You should be probably used to it by now but I need to mention it. Do warm up before performing any Calisthenics workouts. Just before we jump into the exercises I want to mention stretching as well. There are many benefits of stretching and it has overall positive influence on your body. Check more on stretching here – https://caliathletics.com/knowledge/types-of-stretching/. Now, let’s move to the specific exercises in Calisthenics. I do not know a single guy who would not want to have big, developed chest muscles. They are, along with nice shredded abs, one of the mostly sought after physical characteristics. You might have heard that it is very hard to build chest without weights or exercises such as bench press, but in fact this could not be further from the truth. There are reasons why some people think it is much harder to build chest with bodyweight exercises. Calisthenics involve compound movements which involve more muscles during each exercise. That means you cannot really isolate some muscles as easily as you could in the gym. Is it something bad then? Not at all. You can still build your chest if you do it the right way. Push-ups and dips not only engage your chest muscles but they also activate your triceps and front deltoids. So it is important to keep in mind that by working on your chest you will be developing them as well. There are countless variations of push ups and dips, they all involve chest but to a different extent. The key point here is to perform exercises that target chest specifically. What do I mean by this? Think about push ups, you can do wide, regular and diamond ones. You can do it with hands elevated as well as with your feet elevated. You can do slow ones and explosive ones. How does it work then? The wider your hands are the more you activate your chest. The higher your feet are, the more you activate your upper chest. The higher your hands are, the more you activate your lower chest. With so many exercises engaging chest it might be difficult to choose the best ones, that is why I did it for you. 3 Calisthenics exercises to build chest that I think are the best are Chest Dips, Wide Push-ups and Incline & Decline Push-ups. Remember – perfect form, full range of motion and controlled movement! Bent forward more than usually with your torso and legs. Elbows close to your body. This is my personal favourite as few exercises can activate your chest as much as this one. Push-ups are compound exercise and by doing them with your hands widely set apart – you target your chest more. They are not as complicated as dips, although they are very effective! Start off by placing your hands in wider-than-shoulder distance, position your body in the straight line and squeeze your core. Okay so it is actually four exercises, as here I cover both, incline and decline push ups. Decline push ups will generally be harder and they will target more your upper chest whereas incline push ups might be a bit easier than normal push ups and will engage your lower chest more. How to do them? Simply put your feet higher than your hands (decline) or put your hands higher than your feet (incline). You can use a bench, a chair or anything you would like. Remember to keep your body straight and squeeze your core as well! Definitely there are many ways to activate your chest and different parts of it. 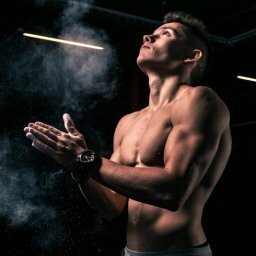 I explained 3 best calisthenics exercises that are the best ones for building chest in my opinion, but there are many more and I encourage you to try and play with other exercises as well. Always remember about the warm-up and proper form when doing them. Bodyweight exercises are one of the best ways to develop back. Pull ups, some hate them and some love them. I hope you are going to love them! They will be your staple in order to build that back. Whenever you want to have the V shape look, learn a muscle up or just develop your back muscles – different variations of pull ups will get you there. With so many different variations everybody will find an exercise for their level of advancement. Do not get intimidated by the difficulty of this exercise, we have all started somewhere, right? To target your back muscles when doing pull ups you should perform them with an overhand grip (on the contrary to chin ups which focus on your biceps). Consider three different variations – wide, neutral and close grip pull ups. Wide grip will emphasise your lats, whilst close grip will put stress on your lower lats. If you cannot do proper pull ups yet try to do negatives or Australian pull ups which we also cover in this section. Generally speaking, pull ups are very compound exercises that also engage biceps and, to the lower extent, chest. The key when performing pull ups is to activate your shoulders (active hang rather than relaxed hang) by retracting them and pushing down. Focus on keeping your body straight and do not kip or swing. This is important as this will engage primarily your back muscles. Remember, quality over quantity. If you find these too hard try to start with negatives firstly, or use resistance bands to make it easier. Find normal pull ups too easy but archer pull up too hard? Try performing pull ups whilst holding L-sit. This requires much more strength than normal pull up. Some call it an inverted bodyweight row. Be as strict as you would have been when doing normal pull ups and activate your shoulders. This is an exercise which is ideal for building strength to perform more advanced pulling movements. You may also experiment with different grips! 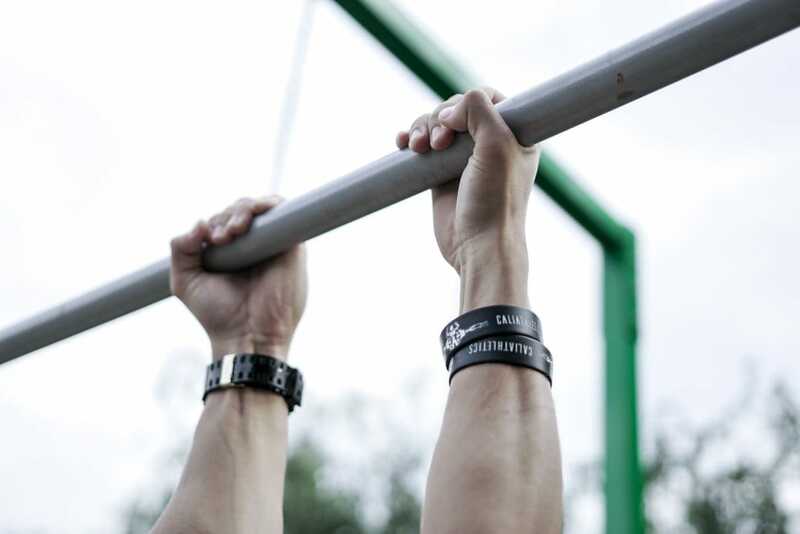 Wide, normal and close grips are not reserved only for usual pull ups. This is an advanced move that will take your pulling game to the next level. It really requires solid foundation so keep working on your basics before you try this one! Keep one of your arms completely straight and then pull yourself up to the side of the pulling arm. Then repeat with the other arm. Make sure to, as always, have your shoulders activated and keep your body straight. In general, pull ups and its variations will develop your back. Keep in mind that lower back will be considered in abs/core section. If you are a beginner, do more Australian pull ups and other preparatory moves such as negative or resistance band pull ups. Advanced athletes who will find normal pull ups too easy may switch to L-sit pull ups, weighted pull ups or archer pull ups to target their back even more! Remember that wide, neutral and close grips focus on different parts of your back and try to mix them. Do you want to look bigger? Build your shoulders. The best thing about them is that movements that I am going to show you are compound exercises that not only will develop your deltoids but also your whole upper body. There are 3 heads of shoulders – front, middle and rear. That means to really hit your deltoids you need to do it with different moves and angles. Make sure you really focus on engaging your shoulders here by sticking to perfect form in each exercise. This might require building more strength with easier progressions in the first place before moving on to harder exercises. This is a very compound exercise which will put pressure on your front deltoids. The good thing about them is that you do not need know how to handstand because you can do them against the wall. Keep your body straight, not bent like a banana. When going down try to touch floor with your nose and always extend your arm fully to perform full range of motion. This is a bit advanced exercise so if you are beginner build your strength first with pike push ups. Face pulls are usually done to focus on rear deltoids. As we are focusing on bodyweight exercises, we want to perform them only with our own body. To do so, find a pull up bar waist/chest high and hold it like you were doing an Australian pull up. Keep your body straight and go up to your face. This is the bodyweight equivalent of normal face pull exercise. This is a great exercise for general shoulder development. Start as with Planche leans and move forward with your body. Then just start doing push ups. Elbows close to body, body straight. Keep in mind you want to do them in a controlled manner whilst keeping the perfect form. Do not worry if you find it too hard, just do smaller lean so that you can keep the good form. I am sure these exercises will be great ones to incorporate in your shoulder training routine. They focus on different heads of your deltoids and engage other muscles in your upper body. I mention this quite a few times in this ebook, but I will mention once again – keep perfect form. It is always better to perform an easier variations of an exercise but to do it the way it should be done. People always say that they want to have huge arms. So they do bicep curls and all of the biceps exercises whilst neglecting the triceps. But do you know what? It is triceps that makes 2/3 of your arm. Many forget about the importance of the triceps and you definitely should not be one of them! There are many ways to build triceps but bodyweight exercises are amongst the best ones. So if you want to have developed arms, make Muscle Ups easier for you or just be strong this section is for you. Triceps consists of 3 heads. Usually, the exercises engage all of them but they do it to a different extent. This is why it is important to properly train and develop all 3 triceps heads. You target different heads more or less depending on the angle of your arms during each movement. What is even better, by training triceps properly not only will you build your arms but it will also be easier to do skills such as Muscle Ups or Impossible Dips. Why? Because they simply require strong triceps. That is why I put below 4 exercises that I believe are the best ones for building triceps. When training triceps it is very important to keep elbows close to your body in the exercises I list below, otherwise other muscles will be involved and less stress will be put on the triceps. This one is a bit different than normal dips as you use straight bar dip in front of you rather than two bars on the sides of your body. Straight Bar Dip is also a pre-requisite move for mastering the Muscle Up. This is a compound exercise which engage primarily your triceps and chest and also your front deltoids to a lower extent. Lean a bit forward and keep your arms close to your body, elbows facing behind you and head neutral. Then simply perform the dip by going lower and returning to the starting position. Let’s now dig into moves that isolate triceps more and activate its different heads. Whoever told you that you need weights to build triceps definitely was not aware of this exercise. Find a bar, preferably waist to chest high (the lower the bar the more your triceps is engaged), and grasp it with your hands, palms facing forward (pull-up grip). Squeeze your core and bent your elbows whilst keeping them narrow until you touch a bar with your head and then return to starting position by extending the triceps. Some of you might find it challenging, but it is definitely worth doing. You will need something to place your hands on for this exercise, could be a bench, a chair, a bar – whatever you have. Say, you got a bench, keep it behind you and position your hands on it with your palms facing straight (the direction where you look). Focus on activating your triceps in this exercise by keeping your elbows close to your body. Keep your legs extended in front of you or place them higher (on another bench/chair) if you want to make the exercise more challenging. This exercise will help you develop necessary strength for Korean Dips. As you might have learnt from the section on How to Build Chest with Calisthenics, push-ups engage both, your chest and triceps. Which muscles are mostly involved depends on how widely you spread your hands. Here is how to do it. Put your hands down and make a diamond shape out of your fingers, bring your elbows close to your body, squeeze your core and keep the body straight. As simple as that, but be careful, they might be challenging for beginners! If so, simply help yourself by going on your knees. These 4 exercises will serve you as an amazing base for developing strength for more challenging moves as well as building your triceps in general. Triceps consist of 3 heads and you should be careful not to focus too much on some heads whilst neglecting the others. Perfect form here is crucial because other muscles might get easily engaged and you will not work your triceps as much as you would like to. You should really focus on the triceps extension by keeping your elbows close to your body. Could you believe if I told you that you can build big arms with NO weights? We have already covered how to build triceps with Calisthenics, now it is a time to talk about how to build biceps with Calisthenics. There are many bodyweight exercises that focus primarily on biceps and will get you the bigger, toned muscle look that many want to achieve. Continue reading if you want to know how to develop these huge arms that will make your t-shirt tight on the sleeves. The logic behind building biceps is to do bicep curls. Although many do them with barbells, we focus here on bodyweight exercises that activate this muscle. There are many ways to engage biceps and we will cover three of them, going from staple exercise such as chin-ups to more sophisticated movements like behind-the-bar Australian chin-ups. Ready? Let’s move to the exercises. The importance of this exercise is huge. This is a compound movement that, although is a similar to pull-up, focuses mainly on your biceps. This is done because you change your grip on the bar and your palms are facing towards you (not forward, like during pull-ups). By doing so, more stress is being put on your biceps. Back and shoulders, however, are still active but to a lower extent. You can think of chin-ups as if you were doing bicep curls with your whole bodyweight. In terms of proper technique, remember to keep your palms facing towards you and your body straight, also do not help yourself with other muscles. That means no momentum and focusing on activating your biceps. This will get you these nicely developed arms! Find a bar which is around waist/chest high (does not have to be exactly that height, the lower it is the harder it goes) and go under it. Grab the bar with a chin-up grip and keep your body straight. During the exercise it is crucial that you focus on that bicep curl rather than pulling with your back. To do it, keep your elbows in the same position and isolate the biceps so you do not do a pull-up movement. If you do it correctly, you will really feel the burn in your arms! Similarly to the previous exercise, find a bar around waist/chest high and stand so the bar is behind you and grab it with a chin-up grip. Now go under a bar (notice that your body is facing ground) and keep your body straight. As always when training biceps, focus on that bicep curl when bringing your body up to the bar. This is a more difficult exercise than previous ones but if you are serious about developing enormous biceps strength – definitely try this one. When building biceps with Calisthenics you really need to focus on isolating biceps in these exercises so the perfect form is very important here. Chin-up is a compound movement that will serve you as a base for developing biceps whilst Bar Curl and Behind-the-bar Australian Chin-Up are more biceps-only exercising which will complement the foundation that you will have built with Chin-ups. Want to become a superhuman? Have a superhuman core. All of advanced movements require you to have very strong core muscles. Think of front lever, back lever, Planche, human flag. Yes, they do engage many other muscle groups but the primary requirement is a strong core. Core muscles include abdominal muscles but are not limited to them as they also include many other muscle groups that act as stabilisers for our body and force transfer centre. In others words, core muscles are engaged in almost everything you do. This is why it is very important to have developed core. As a side effect there is a good chance you will have nice visible abs as well (refer to the nutrition article hyperlink for more info on that)! In this section I focus on developing both – your core and your abs. Read this article if you want to know more why strong core is crucial for Calisthenics – https://caliathletics.com/knowledge/the-importance-of-building-a-strong-core-in-calisthenics-street-workout/. You can think of this exercise as one of the best ways to get great abs muscles. It mainly focuses on your lower part of abs and can get you this nice look (only if you follow diet though). Hang in a hollow body position on a pull up bar and in a controlled movement raise your legs until your feet touch the bar and then lower them slowly. Try to keep your back straight and do not bend it to make the exercise easier. You can do leg raises to 90-degree angle or knee raises as preparatory movements for this one. I consider hanging version here. They put a great deal of stress on your oblique muscles (good preparation for human flag). Start by hanging from the bar, but contrary to the previous exercise, pull your back up so it is parallel to the ground whilst keeping arms straight. Angle between your legs and torso should be 90 degrees. Keep it strict and rotate your torso so your legs are parallel to the ground on both sides, one after another. This will be your staple. Plank is a static movement in which you keep your body straight (as a plank) on your elbows in a hollow body position and head neutral. It puts pressure on your core and abs muscles. The longer you can keep it the better but remember about perfect form. There are many variations of this exercise to make it either easier or harder. The further your elbows are from your chest, the harder it gets. You can also try doing plank on your knees if you are a beginner. For advanced athletes consider doing superman plank – I cover some of these superhuman movements in my Full Body Transformation program. A great compound exercise. Not only it increases the overall health and strength of some parts of your upper body (shoulders, triceps) but it also makes your core rock-hard. Find dip bars, parallettes or even two chairs and position your hands there. Lock your elbows, keep shoulders down and engage your abs when keeping legs straight. Some easier variations may incorporate only one leg straight and harder move is called a V-sit. To quickly sum up, remember about engaging your core and keeping hollow back when necessary. Otherwise you may not put pressure on these muscles and you will not build that abs. Having nice shredded abs comes as much with diet as it comes with exercising so keep that in mind. These movements will serve you as a decent foundation in building core/abs. Calisthenics aims to develop your whole body. Yes. That means there is more to it than upper body. After all, pistol squat is also a pretty effective exercise, right? I guess you do not want chicken legs anyway. Legs training with your bodyweight can greatly increase explosiveness, dynamic power and endurance of your leg muscles. However, you must be aware that in order to build muscle mass it (i.e. incorporate high resistance exercises) it is advised to use additional weight, for example for squats. and risk getting an injury. They build strength of your muscles that will serve you as a foundation for majority of other leg exercises. The correct technique is as following. Put your heels shoulder width apart with feet aiming 30 degrees out. Keep your back normally straight. You should touch the ground with the whole area of your feet during the movement. When squatting, knees should point to the direction of your feet and should not exceed your feet. The full range of motion is performed when you break the parallel of your knees and hips. Squats are great compound exercise and strengthen your muscles and increase health of your overall lower body. If you are an advanced athlete consider doing pistol squat. They are the next level exercise. To increase explosiveness, you could consider doing jumping squats. As I said, there are a lot of variations of this exercise and many of these are covered in my Full Body Transformation program so check it out if you are interested. This move focuses primarily on calves. They can be performed on two feet as well as on one foot. Stand with your toes flat on elevated surface and raise your heels. Then go down to the starting position. You need to perform this in a controlled manner and be sure to engage calves to make the most of this exercise. It might be handy to grab some assistance but be sure not to help yourself with hand. One of the another staple movements for your leg workout. This compound move is performed by stepping forward with one of your legs and lowering your hips until the angles between knees are around 90 degrees. During the move keep your back straight and natural. To increase resistance, you can think of adding some weight, or perform jumping lunges. Not only do these exercises increase your strength and explosiveness of your legs but also endurance, general coordination and overall performance of your lower body. That is why I think it is important to perform them. For vertical jumps simply stand straight, jump as high as you can and raise your knees to your chest. For horizontal jumps stand straight, as before, and jump as far as you can. A word of caution, however, slowly build up your legs performance, always do these exercises after proper warmup and in full range of motion. Otherwise it is easy to get an injury as they put a great deal of stress on your knees. Nevertheless, they are great movements and will increase overall health of your lower body if performed in a correct way. So do not just disregard leg training but incorporate some movements in your routine! Now when you know all of the basic exercises for each muscle group and types of training you can begin crafting your own workout routine. Have a look here for more information on how to do it – https://caliathletics.com/knowledge/how-to-structure-a-calisthenics-routine/.